Tabata talks upcoming Final Fantasy titles. Square Enix brought many announcements to Tokyo Game Show 2014, including that the director of Final Fantasy XV has changed from the creative mind of Tetsuya Nomura to the portable master who brought us the original Final Fantasy Type-0 and Crisis Core: Final Fantasy VII for PSP, Hajime Tabata. 4Gamer spoke with the director about the upcoming Final Fantasy titles. Gematsu covered the important bits of the interview earlier this week, but I’ve translated their article and interview in full below. I’m cross-publishing this here, but I ask that you please also link to my Twitter profile or website if you quote it. Final Fantasy Type-0 HD will be releasing in North America on March 17, 2015, March 19 in Japan, and March 20 in Europe for PlayStation 4 and Xbox One. It will include a demo for Final Fantasy XV called Episode Duscae. Find the full interview below. 4 Gamer presents an interview with director of Final Fantasy Type-0 HD and Final Fantasy XV, Hajime Tabata. This is the Final Fantasy done on next-gen systems he wants us to see. As we previously reported, Square Enix’s Final Fantasy Type-0 HD is releasing March 15, 2015 on PS4/Xbox One. It was was also announced that as a bonus, a demo for Final Fantasy XV will be included. Type-0 HD is an HD remaster of the PSP title Final Fantasy Type-0 that released in 2011. The original announcement occurred at E3 2014 for North America, but the announcement for Japan took place at TGS 2014. Also, FFXV was previously known as Final Fantasy Versus XIII, it is a numbered title in the Final Fantasy series that will release on PS4/Xbox One. New information on both of these titles has barely been released, making FF fans impatient, but developments from here on out will be made clear. Also revealed in this announcement, Square Enix’s Hajime Tabata who is director of Type-0 HD is now working as director of FFXV as well. We spoke with Tabata and asked about his aims with the development of Type-0 HD and FFXV, what he considers FF-esque, and more. — Thank you for speaking with us today. There is a lot of new information announced, but first I’d like to ask about Type-0 HD. Type-0 HD was originally announced for North America three months ago at E3 2014 and is only now being announced for Japan, why is that? Tabata: The truth is, when we announced it, we were developing it with priority for overseas markets. At that stage it wasn’t decided yet that we could do the Japanese version. So for that reason we announced it only overseas, but the reverberation we got from Japanese fans after the E3 announcement was greater than expected. Therefore we adjusted the localization schedule so that Type-0 will be available in Japan and abroad at about the same time. — Did you make the overseas version a priority because the PSP version of Type-0 wasn’t released in North America? Tabata: Yes, that’s right. When Type-0 originally released, there was already a transition from PSP to PS Vita occurring and in North American shops the PSP corner was already gone. Because of that, the overseas release has been pending. — The PS Vita didn’t release in Japan until about 2 months after Type-0. It would have been tough to sell in America where PSP sales weren’t growing like in Japan. Tabata: After that I thought a lot about what the best form and timing to release it overseas would be. We were aware of the fans wishing for Type-0 to release in North America and Europe so in response to that I started thinking that maybe releasing it for home consoles would be better. — Certainly if you look at the numbers, releasing it for home consoles overseas would make it easier for players to receive. Tabata: Yes but at that time I was in charge of portable systems, so developing Type-0 for PS3 a difficult idea for me. What was possible? How much is the budget? How do we schedule it? I couldn’t make those decisions on the spot. — I see. Other than Type-0, you worked on Crisis Core Final Fantasy VII and The 3rd Birthday as well, which are for PlayStation Portable. 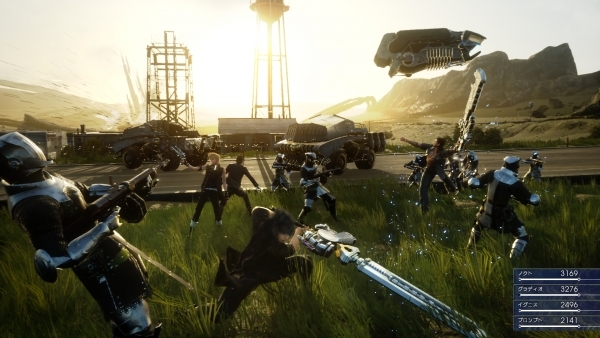 Tabata: In the meantime, the Type-0 team and I became a part of FFXV’s development in July of 2012, which was just the time when internally development for FFXV was being switched to the next-gen systems. It was around then I got a feel of the next-gen environment and thought it was really good. At E3 2013, about a year since the development restart, we put out the FFXV trailer with the battle against Behemoth and Iron Giant. Since I had gained considerable know-how regarding next-gen systems during that time, once again Type-0 came to mind and we started development for releasing Type-0 HD overseas. — The numbers for PS3/Xbox360 are still dominating as far as home consoles go, so despite that merit, you decided to develop for next-gen systems since you’ve had hands on experience with them and knew what they were capable of? Tabata: Yes. Additionally, there were already a lot of PS2 and PSP titles being HD remastered for PS3/Xbox 360. When I thought about bringing Type-0 to the PS3/Xbox 360, it just wasn’t exciting to me. — There certainly have been a number of HD remasters for PS3/Xbox 360 trending recently. Tabata: It’s true. I didn’t want to just HD-ify the existing assets (character models etc. ), I wanted the challenge of advancing it technology-wise. From the lighting and reflecting to the rendering, I wanted to remaster it from the environment and beyond. With that in mind I decided that ultimately remastering it for the next-gen would be best. — I imagine that porting content from a PSP title to next-gen systems must require a lot of rebuilding, especially character models etc. How did that go? Tabata: Actually, for a lot of parts we only had to tweak the PSP version’s assets a little. — Really? Certainly Type-0’s graphics as a PSP title gave the impression of being quite elaborate. Tabata: Indeed. Initially I figured the first thing would be to HD-ify the existing content, but when we went back and looked, the content was really more elaborate than I had thought. I was very pleased, our artists are really wonderful. — It’s surprised to hear you say that, you were the director of Type-0 after all. Tabata: But fussing over all the details is paying off now, so maybe it was for the better. — Given that, has making the HD version been easier than you expected? Tabata: Yes, we haven’t had to entirely reconstruct the resources. — I see. You were lucky this time that the artists were so picky, but what about here onward? Do you think you’ll intentionally make elaborate assets just in case you reuse them in the future? Tabata: Well, hmm. Right now, even more so than raising the elaborate graphic quality, the FFXV team is making sure that the data migrates to each platform smoothly so it looks good on multiple platforms, so in this case it’s probably the opposite. — So it’s more about data that can be used easily between platforms, not elaborating for specific platforms? Tabata: Right. For example, take the presentation of shadows, before the artists would draw the shadows to the building models in the scenery, as one image that looked real. Of course we added lighting, but being drawn, it was just expressed as a big shadow that looked real. — Like the backdrop of a movie scene. Tabata: Yes. But now, you can make the content on the table properly, establish the light source and then the shadows appear naturally. You can make an image that is correct according to physics. From there we give it a signature FF style. — I see. By the way, speaking of FF style, what would you specifically define that as? Tabata: Within a realistic world, unrealistic things are presented without hesitation as if they truly existed. As with Type-0, within realistic scenery, there are unrealistic characters wearing red mantles that teleport. For me, that’s the kind of scene that defines FF’s style. Of course, including a pointed artistic essence is a part of FF style too. — Getting down to business concerning the reform of Type-0 HD, were there any major changes? Tabata: The playable character models. That being said, we actually adjusted the character models that were used to produce the pre-rendered scenes in the original version so in that sense, they’re not really new. This was used for FFXV too, where the pre-rendered character models were converted for gameplay use. We applied the same workflow. — Has the motion of the characters changed as well? Tabata: They’re as they were on the PSP. After all, the frame rate of 30fps is the same. However, now the skirts don’t flip up as much. That’s due to the regulated weight in the HD version. — When I tried the demo hands on I felt that the camera behavior had changed. But it seemed like more than just the camera being assigned to the right stick to me. Tabata: The distance between the character and camera has changed in Type-0 HD. — The camera seems more approaching than in Type-0. Closer to the character’s POV. Tabata: The camera’s position is closer to the character’s back than it was before. So you could say the presence has increased. When you play the game on the PSP, the screen is about 20-30 centimeters away, but when you play it on the big screen you are separated to a certain extent, so we changed the way it is viewed. — I feel like changing the POV influences the gameplay, how was that regulated? Tabata: Playing Type-0 on the small screen, the play style becomes limited to what is within the character’s field of vision. As a game we basically made it so everything occurred within the character’s field of vision. Even though there were enemies who could shoot at you from afar, it didn’t really feel like you were being attacked. But in Type-0 HD, we’ve changed it so that all the elements on the screen are related to the game. However we have regulated it so the gameplay still feels the same as Type-0. — How is the game in regard to degree of difficulty? Tabata: It’s a standard level of difficulty like before, but we’ve made it so you can change the degree of difficulty. We heard that people just barely made it to the ending of the PSP version, so we’ve added an easy mode. To me the ending of Type-0 is a selling point, so having it hard for players to reach is no good. — But the multiplayer feature was also a selling point of the PSP version, what about in the HD version? Tabata: Type-0 doesn’t have multiplayer mode because it is a feature that requires the PSP adhoc function to work. I had to reconsider including multiplayer functions which would have to be designed and rather than spend time on that, I wanted to focus on making the story and battles available sooner. — So the balance has been regulated for a single player from the start to finish? Tabata: Yes. The achievements that required multiplayer have also been regulated so they can be earned playing single player. — I’ve heard that there was a lot of requests from Western fans for Type-0, but a PSP game like this that deals with an academy storyline, I’d dare say is aimed at Japanese audiences, so in general it’s not something I’d expect Western fans to be interested in, it’s a little surprising. Tabata: Just the other day I had the chance to speak with someone working in the Western media, and the thing they were most looking forward to is actually the battle system. They said things like they couldn’t wait to play the seamless action based battles where you can use magic and weapons freely, and that playing a fast paced FF battle without selecting commands was the best. — I see. The different battle system stands out against FF titles up until now. Tabata: Also, in Type-0’s battles, for example if you attack with a sword, your enemy bleeds or if you fight with fire magic, they burn. I wanted these sorts of things to be represented realistically, and many people have acknowledged these details. As for Western fans, I think the war storyline appeals more than the acadamy parts. — With a storyline about being in an academy amidst a war, Type-0’s story is unique among the Final Fantasy series. Tabata: Oh, I wouldn’t say that Type-0 follows the flow of the series. The people who made it are different, and I think the variety they bring is evident. As for myself, I’m not very skilled, so I wouldn’t say it was made based on the FF series more than necessary. As a result of that, it’s wound up with it’s unique style. — So you weren’t heavily influenced by the FF series. On that topic though, you also worked on Crisis Core Final Fantasy VII, which like Type-0, also told a story that was darker than others in the series. Tabata: That’s true. Personally I’m a fan of gut wrenching stories with guys giving their all and fighting for their lives. I make games with what I think is important in mind more than what the fans request. If I don’t have a good foundation in my own mind then making epic developments become frazzled. But of course there are parts that are important as an FF title as well. — Like you said before, making something unrealistic lodged in something realistic. — So what’s the challenge with Type-0 HD? Tabata: I mentioned it a little previously, but it’s not a simple manner of HD-ifying the content and you’re done. Putting it on a next-gen systems means there is a challenge to improving the environment quality, from the lighting etc. There hasn’t really been an example of HD remastering like this yet. Also, as it is Type-0, it’s a unique mix of FF elements and original taste and power. I think that you can tell when you play it. — I see. How far along is Type-0 HD’s development? Tabata: It’s already around 80%. However this is my first time dealing with a development deadline for a home console game, so something could happen here on out. How the people working on the final adjustments process do things, I don’t really know. — So moving along, let’s talk about FFXV. You’re now the director of the game, what was the first thing you became aware of? Tabata: I hypothesized my own release date for FFXV and then carefully examined all the plans in order to make it happen. The fact that we can now offer a demo to fans is because of the favorable progress we’ve made since the new developments in July 2012. — Just from what we’ve seen of the TGS trailer and demonstration, I got the impression it’s well on it’s way to completion. — After seeing that trailer and demo, we can’t wait 5 or 10 years. (Laughs) As for the game, is it fair to call FFXV an open world RPG? Tabata: Assuming that means the world is seamlessly connected, then yes. The story is drawn on getting in a car and driving on an adventure. — Given the scenery and the way the characters exchange with one another, I got the impression it’s like a road movie. Tabata: That’s how it is. We made a road movie you can experience as an RPG. You might say players feel the romance of the adventure first hand. — In the trailer and in the real time demonstration, we only saw male characters, so It felt like a group of guys on a road trip. Female characters only appeared in cutscenes. Tabata: The party characters are all male. This hasn’t changed since it was FF Versus XIII. — FFXV inherits it’s road movie feel from FF Versus XIII? Tabata: Yes. FFXV is being made with an even stronger sense of a road movie. It’s an important part. — Really? Seeing this trailer is the first time I got the real road movie impression though. Tabata: Isn’t that because we haven’t really shown anything outside of cities? So far we’ve only shown footage that took place within cities. — I see. Seeing this trailer, I thought, I want to try going all sorts of places. Tabata: Ah, that’s what we aimed for, so I’m really grateful to hear that’s how you felt. — The system changes a lot with each title in the FF series. What kind of game is FFXV? Roughly explaining, what will happen? Tabata: My FFXV proposal was to write an open world style Final Fantasy. The word “style” is an important point. The world is spread out seamlessly, but it is unlike a typical open world RPG, it’s not the kind of game where no matter where you go, you progress. As this is a FF series title, you’ll be able to do things like level up your character and collect items while stepping into various regions in line with the story. The story has a flow where you’ll experience drama along the way and then finally reach a climax. — So you can walk around the world freely, but there is basically only one storyline to follow, and everyone who plays it will more or less follow the same flow? Tabata: Yes. For example, it’s not like The Elder Scrolls V: Skyrim where you can go wherever you like and do quests to your liking. Whenever you enter into a marked destination with your party members, you are presented with a progressing reaction. It might be closer to Red Dead Redemption in the way that the first time you arrive at an important place, the storyline progresses. — So are cars the primary mode of transportation? Tabata: Yes. Noctis is royalty of the country called Lucis, and transportation in the game is primarily by royal car. However, you are also able to get around by walking. — So if you wanted to, could you walk to the next destination? Tabata: Of course. But the world is extremely vast, so no matter how much time it takes walking, you won’t reach your destination. (Laughs) Because of that, the cars are driven on roads, and you walk in the places the car can’t go. — We saw in the live demonstration at TGS 2014 that the weather conditions change. Tabata: In that world, there is time progression and weather that transitions naturally. When it rains, the characters and ground naturally get wet. Water forms in puddles on the ground and the water’s surface quivers, and when the rain stops it begins to dry. We are introducing a flow of nature that acts in accordance with time accurately. Because of this sort of realistic presentation, I think we’ve made a living world that you can be absorbed by. — On the field and in battle, the user interface (UI) looks simple but impressive. Tabata: Yes, it’s not in it’s complete form yet, so we couldn’t demonstrate the full use of the UI information, but you get a better sense of how it’s established playing in a 3D space. That being said, you’ll be able to set the techniques you use upon that 3D space beforehand. It’s kind of close to the “gambit” system from FFXII. — We also saw scenes where Noctis teleported. Tabata: Being a weapon summoner is a special ability of Noctis’. He can throw his sword and then teleport wherever it sticks out. There are spots in battle where you can stick his sword, but it’s limited by certain conditions. Also depending on the situation, those conditions change, and the number of spots you can stick the sword increase. — How do you operate in battles? Tabata: You don’t choose commands, you fight while switching between offense and defense. The only character you can control is Noctis, but the other characters operate based on a strategy assigned by the player and they act automatically. Of course even in battle you can pull up the settings screen and change the strategies and individual weapons of all your party members. — Do the weather variations influence battles? For example, when it’s raining and everything is wet, do thunder attacks cause greater damage? Tabata: Yes. This is the case in Type-0 as well, but we plan on treating magic in FFXV as a “phenomenon.” When it’s clear out, casting fire on a monster will result in other things like the surrounding area being ignited and your party members becoming feverish. When you use magic, there is a risk that it affects Noctis’ himself as well. — The live demonstration was centered around a battle, but the actual game will have fields, cities, etc. right? Tabata: Yes, you’ll be able to do things like eat meals in the city. Usually it’s a camping livelihood. — That sounds kind of fun. Tabata: This time camping has an important role regarding the system. FFXV has a general concept of time, so if you on without sleeping the character’s performances become poor. — Like an element of simulation. Tabata: It’s not extreme to the extent of a simulation game. When one day ends, that day’s earned experienced is added up, so it’s a system aware of the time. Tabata: Naturally the field of activities will be limited in some way or another, but despite that it I think it will still feel quite spread out. We are planning on having the demo take place around the meteorite or “astral shard” shown in the trailer. You’ll be able to fight monsters on the field and there is also a dungeon. The enemies in the dungeon are super strong. You can still enjoy the story even if you don’t clear the dungeon, however there are rare items that can only be obtained in the dungeon. — The dungeon is an extra challenge component. Tabata: Yes. Also when it becomes night, the enemies from the dungeon come lurking out. Therefore it might be a good idea to rest and make camp at night. — You really get the sensation of a realistic adventure then. Tabata: Yeah, if you didn’t then the experience would be just average. That’s something I’m very particular about. When we talk about demos for Final Fantasy titles, for me Leviathan in the Final Fantasy VII demo version left a strong impression, so I plan on doing something that sticks in your memory like that. — So that’s something everyone who plays it will see, even if you don’t do anything particularly special in the demo. Tabata: Of course, I definitely want you to be surprised. — You said before when we were talking about Type-0 HD that “it’s not Final Fantasy if there is no challenge,” so what’s the challenge with FFXV? Tabata: It’s a game you could call grand, a “triple A Final Fantasy.” Explaining specifically what makes it so is difficult, but for those of us working on it, it’s an extremely distinct challenge. I think it’s connected to making sure that the people who play it think that this is the greatest Final Fantasy. — The feeling like everything that you want should be done sparing no effort? Tabata: Of course sparing no effort, but even with that mindset, there are things that we can and can’t do. A strong portion of the development of Final Fantasy games is dependent on the ideas and persistence of it’s creators. If that’s not nurtured, than the essence of FF doesn’t come out. There are a lot of things that are made paralleled in each game, but I don’t think simply gathering those elements makes a Final Fantasy game. FFXV isn’t like an overseas triple A title with a staff of 1000 people working on it. Therefore we boost the density of our 200-300 staff, and do what we can to get the most out of what everyone can do. — But it must be rough for you to make sure that the talents of each member of your 300 people team is made the best of. Tabata: That’s why I talk to many people about all sorts of things everyday. No matter how much time there is, it’s not enough. But the demo is one goal we want to accomplish and development is on track, so it’s enjoyable. — Would you say that the suggestions you get from development staff shows their individuality? Tabata: Rather, we can’t afford to not see their individuality. What is most important, is giving players a game that we believe will leave an impression in their hearts. That’s what takes time to make happen. For me, when I think of RPGs I played in the past, I think were there or were there not 10 stand out scenes per title? We are aware it’s difficult to move the hearts of players and leaving a lasting memory, so we are very picky about it. — In that case, what scene from the publicly revealed FFXV content do you think has left an impression so far? Tabata: Just from the trailers, I’d say Adamantoise. Also what we showed off in the live demonstration. It’s the first time we’ve shown the characters in a long time and I hoped that it would appeal to players to show them that they’ll be able to operate the characters the way they look in the cutscenes. I wanted to show fans the realness of the characters and the picturesque quality. — The graphic capabilities of both the PS4/Xbox One are extremely photorealistic. On the other hand though, even though Final Fantasy characters have become more realistic, there is something that is exceptionally beautiful and attractive about them. Is it hard to find a balance between beauty and realism? Tabata: Certainly, we worry that if they look too realistic, it would ruin the presentation. The appearance of the skin especially has that tendency. As a Final Fantasy character, Noctis is pretty than a real person. And since he must exist as something to be yearned for, so to speak, we pay a lot of attention to that balance. It’s no good to have them simply look real, but they can’t look like mannequins either, their hair should quiver when the wind blows, etc. At the current stage, I feel that we have reached a balance where they are not perfectly humanistic but not completely fake either. — I feel that having such characters is part of what defines Final Fantasy. Tabata: The Square Enix movie team is very particular with their work, even if the image is just one car or one chair. It’s the same as a professional photographer making something wonderful out of simple subject matter. We want to present the characters of FFXV in the same way. No matter what kind of scene it is, the movement of those characters will be worked on thoroughly. — I see. That makes a wonderful image. Tabata: Games these days in general have seamless worlds and interesting adventures and battles, so making sure that the first time you see the game you are drawn in, is something that the entire staff is concerned with. I’ll be happy if players are moved by what they can experience through the screen. We are polishing it so that is what players feel when they get to play it for themselves, and I hope that fans got a glimpse of it with the trailer and live demonstration this time. — I think we did. But as you said before, you’re only about half way there. Tabata: As for development of current home consoles, the content must be decided first, so it becomes a flow of doing the necessary work in order. Right now we are at a stage of processing our work, but even though the schedule won’t have any major changes, the amount of material resources we are dealing with is tremendous. We have just a little further to go towards our goals. — I know that with smaller scale titles, you make them first and then attempt different methods for what doesn’t work. But you can’t do that with something on the scale of Final Fantasy, can you? Tabata: After the planning is finished we start the actual work, from there setting up the programs and assets takes about 3 months. From that point onward making major alterations is difficult. Basically it’s like once you’ve crossed an established landing point, from there you spend everyday making detailed adjustments. Especially since this is my first time developing an HD title, it’s been a different sensation than developing before. — (Laughs) Well then, do you have a message you’d like to send to the fans who are waiting on Type-0 HD and FFXV, which you’re working so hard on? Tabata: We are making Type-0 HD a new experience even for those who have already played Type-0. Of course, I can recommend it with confidence for those who are playing it for the first time, so please check it out. Also Type-0 HD will contain a demo version of FFXV, and I want fans to experience the evolution of Final Fantasy for themselves. By all means, please find out for yourselves what Final Fantasy is like on the next-gen systems. All of the creators who worked on this game want everyone to play this demo. As for myself, I’ve been working with the thought in mind that if this doesn’t become an industry benchmark, it can’t be called Final Fantasy. I think that once you get your hands on it, you will truly see what the PS4/Xbox One are capable of. — We are looking forward to it. Thank you for speaking with us today.